The Bishop of Oxford writes about why faith communities are so strongly equipped to respond to climate change. 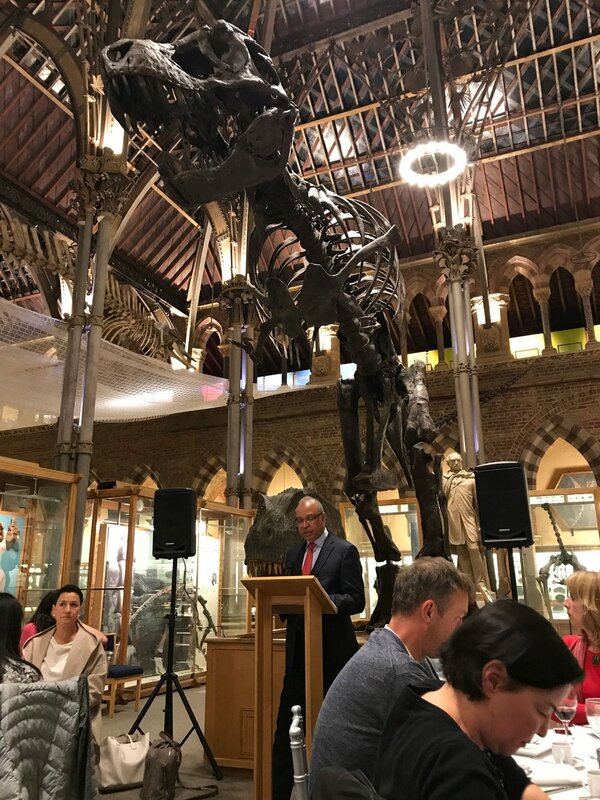 Following an historic meeting at Oxford University's Museum of Natural History, he reflects on why climate change negotiators should be engaging first and foremost with faith communities. This is a shortened version of Bishop Steven's blog, the full version of which you can read here. Last week I had the immense privilege of speaking with about 50 senior climate change negotiators from all across Europe and the developing world. Everyone I spoke to affirmed the reality of climate change affecting their country through drought or extreme weather events. 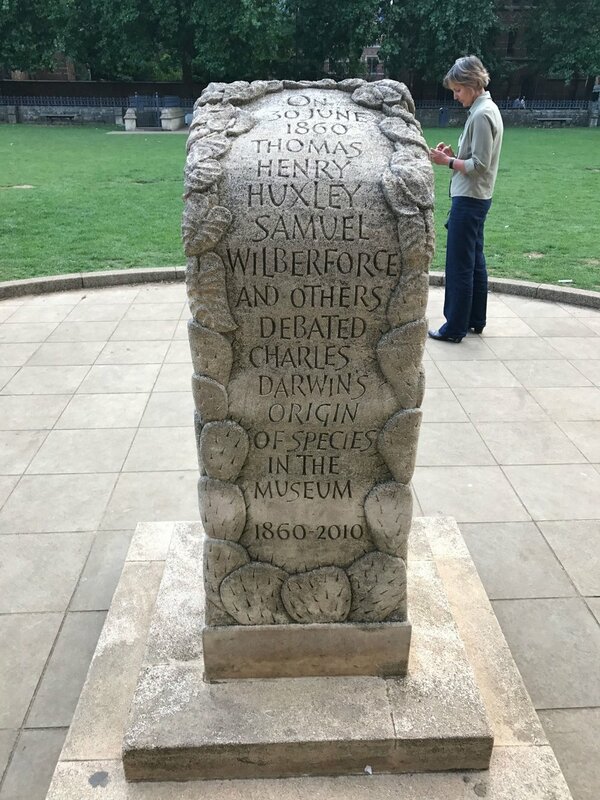 The Museum of Natural History hosted a famous debate in 1860 as one of its first events between Samuel Wilbeforce, Bishop of Oxford and Thomas Henry Huxley, later known as “Darwin’s bulldog”. The debate centred around faith and science in opposition to each other and in particular Charles Darwin’s Origin of the Species, published a few months earlier. The debate is commemorated on a large stone at the entrance to the museum (photo to the right). The dinner last week looked back to this debate and focused on the climate change and the approach of the faith communities and of scientists. Unlike 1860, all parties were agreed that we must do all in our power to use our different insights to combat climate change for the sake of present and future generations. First and foremost because faith communities make up the majority of the global population. Ten years ago, long before the historic Paris agreement, the UK’s environment agency asked 25 leading environmentalists what needed to happen (As reported by Joe Ware in the Church Times, 11th August, 2017). There were 50 suggestions. Second on the list, behind improving energy efficiency was that religious leaders should make the environment a priority for their followers because of the enormous potential influence for change. agnostic or atheist. The remainder belong in some way to one of the great world faiths. 31% of the global population is Christian. 22% belong to Islam. Within the European Union 72% of the population still claim some sort of adherence to Christianity. Just 20% would claim to be atheist or secular though there is considerable variation across the continent. What churches and faiths teach on this subject matters. Second, faith shapes values and lives in powerful ways. The Christian faith helps people aspire to virtue, to living as God intends and often against personal self interest and for the sake of others. That is exactly the attitude the world needs to combat climate change. misunderstood as a hook on which to hang our petitions: the things we ask from God. Actually it is a prayer which points back to the worshipper: help us to be content with exactly what we need this day: “Help us to be thankful just for what we need to stay alive”. The Lord’s Prayer is the most powerful antidote to greed and consumerism the world has ever known. Church of our sisters and brothers across the world. I am looking forward to visiting South Africa in September with our link Diocese of Kimberley and Kuruman. Many local churches and dioceses have these international relationships. In one of our sessions we will be studying climate change. When we listen to the news about the disproportionate effect of climate change on the poorest in the world, these are our sisters and brothers. Fourth, our feet are dancing to a different song (or they should be). There is a close connection between the global economic system and climate change. The planet cannot sustain continuous expansion in energy consumption. Increasingly the world of politics and economics dances to a single tune: continuous economic growth and expansion. We need alternative ideologies to support a more sustainable world. The faith communities have alternative ideologies – a different authority: in the case of Christians, the Scriptures and the person of Jesus Christ. I am the patron of a small campaigning organisation, Hope for the Future. Hope was founded in 2013 by a small group of churches in Yorkshire and specialises in equipping local churches and other faith groups to lobby their MP’s on climate change issues. Last year Hope for the Future trained over 1,000 people in our lobbying approach. Through our training and one to one support, we have impacted over 100 climate conversations between MPs and their constituents this year. We know from feedback from local churches and from MP’s that Hope makes a difference. The anthropologist Margaret Mead said this. “Never doubt that a small group of thoughtful committed citizens can change the world. Indeed it is the only thing that ever has”. I suspect that most of us will know that quotation more from the West Wing than from Mead herself. Newer Post"Do you want to preach at people or get something done?" Conservative MP for Tonbridge and Malling gives his advice to climate campaigners.